This post is sponsored by General Mills Cereal. Thank you for supporting the brands who support this blog. Wow, talk about a crazy year! Aimery started preschool this last fall and we were finally getting into a decent routine when winter break came out of no where, and it was downhill from there! LOL, how many other of you moms feel this way? We just moved into our new home so it’s time for some better changes, especially our change in our morning routine now that preschool is back! Being a single mom, I try to make mornings as simple and quick as possible while running out the door at 7AM. Keep reading for five tips for a better morning routine! Packing both of our bags and lunches the night before has been the best thing for getting into a better morning routine! Not only does it keep me from stressing out to much in the morning getting everything together, but it also helps me not to forget anything! Programming the coffee pot to make you coffee in the morning is such a simple, yet wonderful thing. I’m guilty of hitting the snooze button about 1000 times before finally getting up 10 minutes before having to leave. This makes for a stressful morning and leads to a pretty unproductive day. I’ve been trying harder to wake up before Aimery to give me a chance to have a few minutes to myself and avoid the rush to leave! Long gone are the days where I make a huge breakfast for Aimery when he wakes up in the morning. 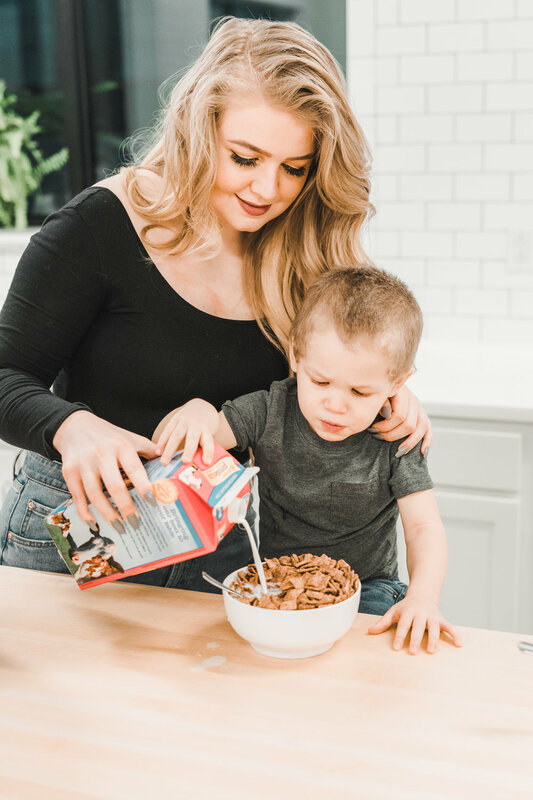 If I’m being honest, I’ll more often then not give him a bowl of cereal or a granola bar while running out the door in the morning. Although I still make us a hot breakfast on the weekends, I have found that it just doesn’t work during the week. And I’ve accepted it! I often reach for General Mills cereals, especially now that they launched the new Chocolate Toast Crunch at Walmart! It’s an easier breakfast option that allows me to be less stressed while getting Aimery out the door in the morning. 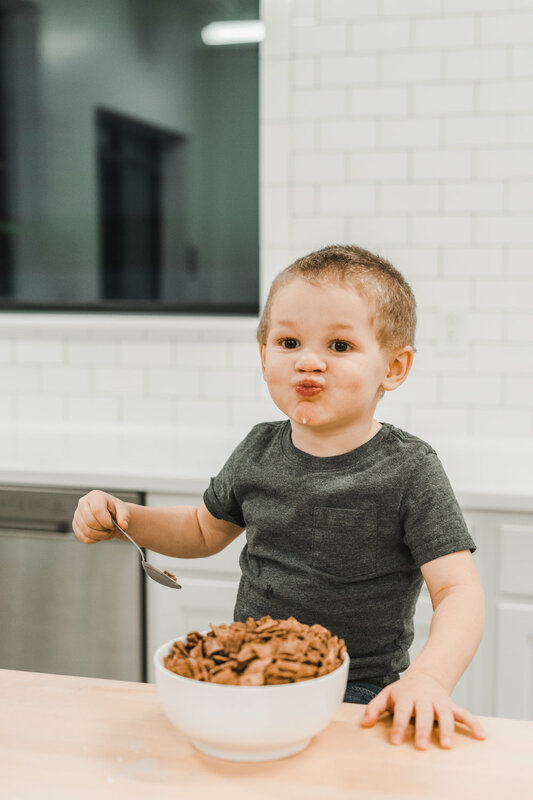 Aimery loves this chocolate and cinnamon cereal with crunch! It tastes so good (see photos below! ), as it’s like eating dessert for breakfast! You can pick up the new Chocolate Toast Crunch at your local Walmart. My friend Joy decided that in 2019 she was going to set habits, not resolutions, and she has totally inspired me to have a better morning routine! By weekly setting five goals that you want to achieve every morning, you will feel more productive and ready to take on the day! This week, my five habits are getting up 30 minutes earlier, washing my face, making the bed, doing my makeup, and eating breakfast. What tips do you have for keeping up a good morning routine? Let me know in the comments below!